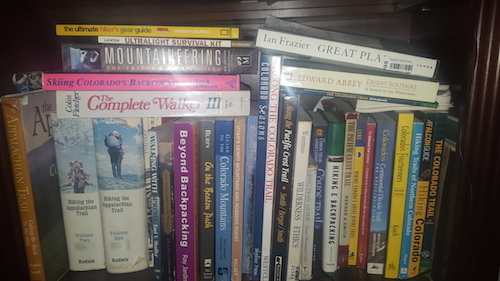 After publishing my overview of Mountaineering: The Freedom of the Hills last week, and more than a few people referring to it as a book that is “The Bible” for the outdoors, it occurred to me that there a few books that will enhance any outdoors person’s personal library. I recycled the same photo from last week, too! Books that have stood the test of time. Books that inspire, teach, influence or make us think about how the outdoors is perceived. And will often be picked up again years later. Here are my picks for books on the outdoors. These are all books I have read, enjoyed and/or learned from over the years. The only self-imposed stipulation I’ve had for this list is that the books had to be at least fifteen years old. I wanted to discuss books that have been relevant for a while and, I think, will continue to be relevant going forward. This list is not complete. There are other books that probably should be read…and other other books I’ve enjoyed that aren’t listed. Perhaps, someday, I’ll expand this list. In the meantime, I feel these books will form an excellent personal library for any outdoors person. Mountaineering: Freedom of the Hills by various editors: A book, now in its eighth edition, that every outdoors person should own. Not just for mountaineering, the book covers all facets of core outdoor knowledge. The textbook for the outdoors. Get it. The Complete Walker by Colin Fletcher: “(Walking) can in the end become an addiction, and that it is then as deadly in its fashion as heroin or television or the stock exchange. But even in this final stage it remains a delectable madness, very good for sanity, and I recommend it with passion.” The last edition of this book, written by solely by Fletcher himself, is now over thirty years old. But it is a book that still speaks to many. The core advice will always apply even if the specific gear reviewed may no longer be in use. However, you read Fletcher as much for the “Why?” of the outdoors as opposed to just the “How?” and “What?” of the outdoors. Wilderness Ethics: Preserving the Spirit of Wildness by Guy and Laura Waterman: Though written just as cell phones were becoming inexpensive and common, what the Watermans discussed back in 1992 is perhaps more applicable now: How to maintain the wilderness, enjoy it, yet still retain the wild character about it? With the National Park Service planning to have wireless access in all parks by 2018 (“so they [park users] can do their work while they are on vacation”), the book and the discussion it engenders is more timely than ever. Water is key in the American West. And Cadillac Desert is a great book for understanding the nuances of this important, and vital, resource. Desert Solitaire: A Season in the Wilderness by Ed Abbey: “Cactus Ed” was a womanizer, a bit racist, a hard drinker and outrageous for the sake of being outrageous. As more than one scholar said, taking on a role he was playing for himself. Ed Abbey, on the other hand, was a defender of the wild places. Places he wrote about eloquently and forcefully. Read Desert Solitaire to experience Ed Abbey and see his gorgeous descriptions of the desert landscape. Heed his warnings about Industrial Tourism and then visit Moab, UT to see how true this prediction has become. Or just watch this linked video and see for yourself…after your read Desert Solitaire of course. Not Without Peril: 150 Years of Misadventure On The Presidential Range of New Hampshire by Nicholas Howe : The Presidential Range, aka “The Presies”, are small mountains with wicked weather. Being in close proximity to both the Boston and New York metro areas, millions of people are within a few hours drive of these mountains. A combination that has led to many mishaps and tragedies over the years and also very recently. Not Without Peril is a chronicle of some of the more telling tragedies from years past. Almost clinical in the telling of the tales, the book is worth reading. Chronicles of how bad luck, lack of preparation, fluke accidents and/or hubris can all lead to tragedies when outdoors. As a New England native who did his formative backpacking in these mountains, the book held my interest. However, the book and the incidents described in the pages, are cautionary tales any outdoors person should heed. A River Runs Through It and Other Stories by Norm Maclean : The outdoors as a place of reflection for life’s questions is a recurring theme in outdoor literature. Walden being perhaps the most well-known and Big Two-Hearted River also showing how nature can also offer solace along with the questioning. But it is the quiet reflection of A River Runs Through It that I prefer in many ways. No grand pronouncements or thoughts. Just what seems a simple narrative revealing much as the tale is read more. The stories of working in the Forest Service are also of interest to anyone curious about the American West at the turn of the last century. The frontier days were over, but Montana was still very much a wilderness area. Into the Wild by Jon Krakauer : The story of Chris McCandless still stirs up controversy. An overly romantic and young twenty-something who went into the Alaskan wilderness unprepared. But Krakauer’s tale resonated as many people were, perhaps, a little overly romantic as well in their early 20s. Some see the book as celebrating a life squandered. I see it more as a book of a life examined and, parts of it, that could mirror ours: The yearning for something more and seeking it especially during young adulthood. Blue Highways: A Journey into America by William Least Heat-Moon : The road trip is, in many ways, the classic American journey. Taking to the road, exploring out the way towns and meeting people on the way. Travels with Charley tackles similar themes. But the scope and feel is different between the two books. Least Heat-Moon was not a well-known author at the time and was in different economic situation to say the least versus Steinbeck. Heat-Moon could travel, explore and write without being The Great American Author. Travels with Charley is enjoyable at first then almost sad at the end. Blue Highways is simply memorable. Perhaps not truly an outdoor book, but more about a journey. And still well worth reading. one. As I wrote earlier: “the editor of this anthology describes the book as a patch-work Appalachian quilt. And that is an apt analogy. The Appalachian Trail Reader collects writings on geology, history and the culture surrounding the AT. The book also features musings on the trail and the Appalachians in general from the raw, but powerful voices, of everyday hikers to the eloquent musings of Thoreau and Wendell Berry. Whether reading about a conscientious objector in World War II working in the Smokies, David Horton’s historic speed hike, Thoreau’s wanderings in the Maine woods or Wendell Berry’s musing on the end of the journey, there is something in this anthology for any person who has a passion for the Appalachian Trail.” If you are curious about all aspects of the long trails beyond what is seen online and in popular media, read this anthology. As mentioned there are other books I could list. Or ones that interest me that I have not read yet. I’ll assume you have read most of Fletcher’s other works – highly recommended. River is among my favorite books as well. and “The Man Who Walked Through Time” was a birthday gift one year just before I moved to Colorado. Grand Obsession is a book I have been meaning to read.